On the up and up: Anissa Lamare, 21, has been downhill mountain biking, since17. YOU COULD BE into cave-diving or sky-surfing, waterfall kayaking or big mountain skiing… craving that hedonistic, adrenaline rush. But, what if engaging with extreme sports becomes a matter of survival? And, a single-minded pursuit for defying naysayers and non-believers? To make a point about sisterhood, solidarity and empowerment? Delhi-based Kopal Goyal might be a regulation rock climber, but she is also slipping down frozen waterfalls, riding into the churning waves, rolling over mountains and thermalling in the skies with a camera in hand—a Canon EOS 7D. Goyal is making a 40-minute documentary on 16 women athletes and 12 extreme sports. And the elfin-like 25-year-old, a self-taught filmmaker, is learning and shooting 10 outdoor extreme sports. Titled Project Wild Women, its extended trailer was launched at the IMF Mountain Film Festival in Delhi in February and won the People’s Choice Award. Sky is the limit: Rinzin Doma Bhutia (wearing white helmet) is one of only two women paragliding pilots to fly commercially in India. Goyal defends her injury like a keepsake from exploits in faraway lands. In this case, it happened at Mulki, a small village off the coast of Mangaluru. 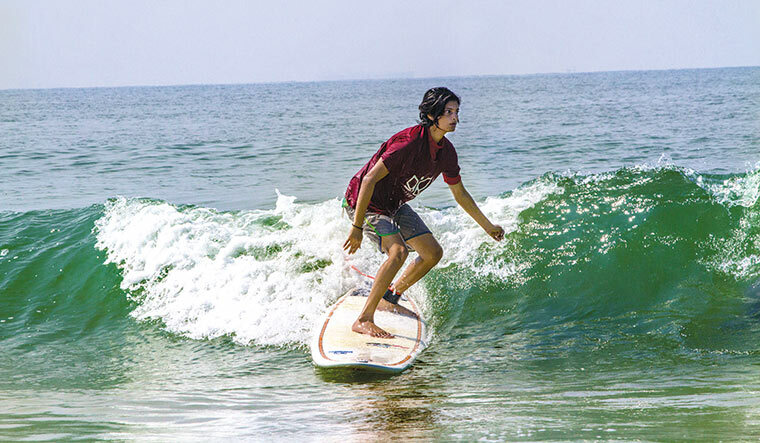 Goyal was there to shoot a young competitive surfer, Aneesha Nayak, in action. On the last day of the shoot, Goyal lost the GoPro camera that she had borrowed from the local surfing club, and went bonkers looking for it on the sea-floor. “That camera costs at least Rs 30,000. This is a crowd-funded project. Darkness descended over my eyes that day,” she says. Kopal Goyal, who is shooting the documentary. Goyal managed to pay off this debt last month by returning a second-hand camera which cost around Rs 11,000. Even when faced with threatening situations—like her narrowly missing a crashing icicle while rappelling on a frozen waterfall in Spiti Valley, or spraining her knees and shoulders while hunting for thick ice for skiing in Himachal Pradesh—Goyal zealously guards her camera. Like holding a baby with one hand above the swirling waters in that famous scene from Baahubali; Goyal demonstrates her analogy with a book. “Unless I know for real the challenges these athletes face, how will I shoot them? I learn every sport before shooting it,” she says. Gathering courage to document the lives of extreme athletes on her own terms was not easy for Goyal. Born and raised in Begusarai, Bihar, she wanted to escape the stifling environs of a traditional middle-class family where she was constantly reminded of her eventual “fate” as a girl (marriage!). She was relieved to come to Noida to study mass communication and journalism in a college she doesn’t want to name. “It doesn’t even exist anymore I think,” Goyal says nonchalantly. After doing an entry level desk-bound job which could not placate her restive spirit, Goyal discovered mountain climbing while preparing for Air Force exams. An uncle helped her join a basic mountaineering course at the Jawahar Institute of Mountaineering and Winter Sports in Jammu and Kashmir in September 2014, the year the state was ravaged by devastating floods. Goyal could not be reached for 20 days until an Army man traced her down. 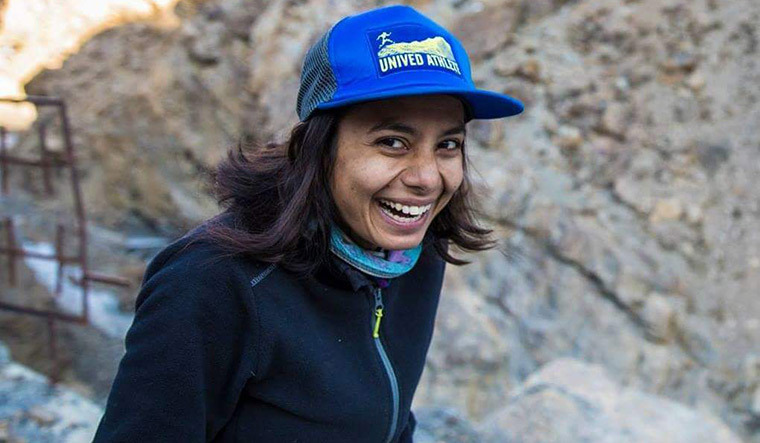 “Our camp was at an elevation in Sonmarg, so we were all safe,” says Goyal, who returned to take up climbing in earnest at the Indian Mountaineering Federation in Delhi. She started giving private yoga classes to pay rent and fund her climbing expeditions. She also made a film on climbing called Ganesha 8b+, on India’s hardest sport route in Badami, Karnataka. Making waves: Surfer Aneesha Nayak. A break-up in 2016, constant pressure to get married and a financial crunch drove her to the edge of despair. “I was depressed and suicidal,” says Goyal. “Then I realised: What the heck! I haven’t come so far to sit and cry. Surely there are other women like me?” This led her to trace 14 women athletes across skiing, surfing, rock climbing, downhill mountain biking, BASE jumping, ice climbing, longboarding, skateboarding, highlining, kayaking, paragliding and trail running. These athletes are not record-breakers who have been splashed across news reports, but women who are stubborn risk-takers. They make it to the edge and back as something normal and life-enhancing. With the making of the documentary, Goyal is inadvertently forging a network of like-minded, highly athletic women. For shooting every segment, Goyal stays with the athletes to save costs. This collaboration moves like a neatly synchronised dance and somewhat works on the principle—I’ve-Got-Your-Back-and-You’ve-Got-Mine. 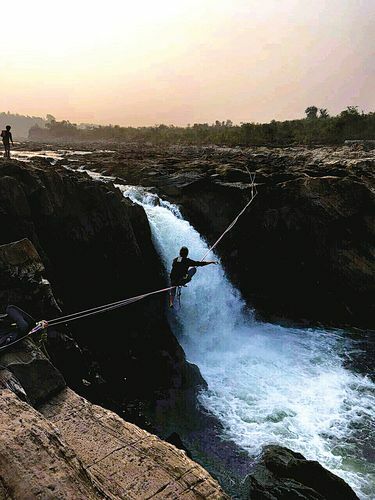 Balancing act: Tanmayi Gidh, 22, is one of the very few Indian women attempting to walk end-to-end on a highline. Twenty-five-year-old Prerna Dangi from Delhi is possibly India’s first female ice climber. She explores and climbs frozen waterfalls and will be co-hosting an international ice-climbing festival in Spiti next year. While shooting for Wild Women with Goyal at the Lingti waterfalls in January this year, Dangi says she had Goyal on her mind all throughout, “How many women in India can handle ropes over ice and shoot at the same time? I felt so responsible.” Dangi says she was fortunate enough to invest in learning a new skill with supportive parents. She went to Russia, Sweden and Alaska to train, compete and buy equipment. Even so, it is hardly smooth-sailing. “When your prove you are strong, you are picked on for ‘looking’ too strong as a woman!” Dangi says. Thirty-year-old Rinzin Doma Bhutia’s hefty build scares tourists in Sikkim. She is one of only two women paragliding pilots to fly commercially in India. Says Bhutia, ”I am a little fat and my clients say you can’t be a pilot if you are fat.” Bhutia, who does not own her own paraglider, has been flying for the last eight years with no accidents. During peak season, she flies eight times a day. For Wild Women, she flew from south to east Sikkim in a borrowed paraglider. For 21-year-old Anissa Lamare, home is where the bikes and trails are. 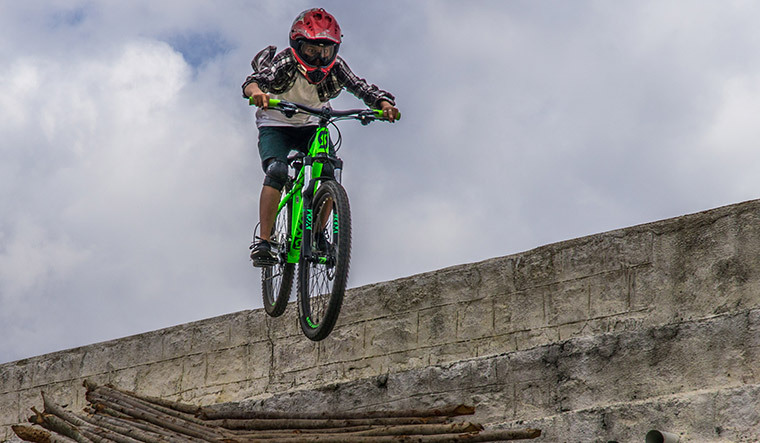 She has been downhill mountain biking (DMB) in Shillong since she was 17, and, after years of saving up, her mother finally got her a proper mountain bike last month—a pre-owned Nukeproof Mega Comp for Rs 1.4 lakh. Lamare has been competing in DMB races with men. There is no women’s category in the sport in India. “I am a tiny being of 4’10, and I feel like 6 ft when I ride,” says Lamare. Pune-based Tanmayi Gidh sums up the Wild Women project best. This 22-year-old is one of the two or three Indian women attempting to walk end-to-end on a highline. There are only 20 bonafide highliners in India who have completed walking from one end to the other—all are men. “We have not completed walking the line. But, very soon,” says Gidh.